Digitization help student to explore and study their academic courses online, as this gives them flexibility and scheduling their learning at their convenience. Kidsfront has prepared unique course material of ELEMENTARY MATHEMATICS Time And Work for CDS Exam student. This free online ELEMENTARY MATHEMATICS study material for CDS Exam will help students in learning and doing practice on Time And Work topic of CDS Exam ELEMENTARY MATHEMATICS. The study material on Time And Work, help CDS Exam ELEMENTARY MATHEMATICS students to learn every aspect of Time And Work and prepare themselves for exams by doing online test exercise for Time And Work, as their study progresses in class. Kidsfront provide unique pattern of learning ELEMENTARY MATHEMATICS with free online comprehensive study material and loads of CDS Exam ELEMENTARY MATHEMATICS Time And Work exercise prepared by the highly professionals team. Students can understand Time And Work concept easily and consolidate their learning by doing practice test on Time And Work regularly till they excel in ELEMENTARY MATHEMATICS Time And Work. 16 men are able to complete a work in 12 days working 14 h a day. How long will 28 men working 12 h a day, take to complete the work ? Solution Is : Let work will complete in = k days Day H Men 12 14 16 k↑ 12↓ 28↓ k : 12 :: 14 : 12 :: 16 : 28 k = 12 * 14 * 16/ 12 * 28 = 8 days. Smita can finish a work in 12 days and Shyam can finish the same work in 9 days. After working together for 4 days they both leave the job. What is the fraction of unfinished work? 8men can paint a house in 5 days. How many men will be required to paint the same house in 4 days? 16 men are able to complete a piece of work in 12 days working 14 hours a day. How long will 28 men, working 12 hours a day, take to complete the work ? Solution Is : 16 men completes a work in 12 days working 14 h a day. M? = 16 men, D? = 12 days, Hour (H) = 14 We have to find 28 men working 12 h a day complete the work in M? = 28 H? =12 D?= ? We know that, M?D?H? = M?D?H? 16 * 12 * 14 = 28 * D? * 12 16 * 12 * 14/ 28 * 12 = D? 8 = D? Hence, 28 men working 12 h a day completes the work in 8 days. Solution Is : Raja can do a piece of work in 20 days. Work done by Raja in a day = 1/20 Ramesh can finish the work in 25 days work done by Ramesh in a day = 1/25 Ramesh started working and Raja joined him after 10 days. It means Ramesh work alone for 10 days and after 10 days the remaining work is completed by both Ramesh and Raja. So, Ramesh 10 days work = 1/25 * 10 = 2/5 Now the remaining work (1 - 2/5 ) = 3/5 Ramesh and Raja one day work = 1/25 + 1/20 = 4 + 5/100 = 9/100 Remaining work completed by Ramesh and Raja = 3/5/9/100 = 3/5 * 100/9 = 20/3 Whole work is completed in = 10 + 20/3 = 50/3 = 162/3 days. In a house there are eight 40 watt bulbs Which are burning for 5hrs a day and four 80 watt bulbs burning for 10 hrs a day. If electricity costs 2 per kilowatt per hour, What is the monthly bill? 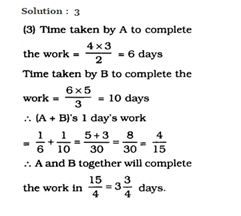 A and B together can complete a piece of work in 18 days, B and C in 24 days and A and C in 36 days. In how many days, will all of them together complete the work ? A can complete 2/3 of a work in 4 days and B can complete 3/5 of the work in 6 days. 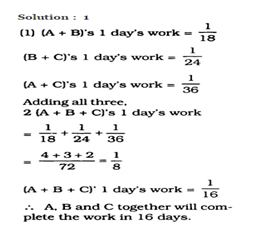 In how many days can both A and B together complete the work ? Solution Is : (A+B)`s 1 day work = 1/20 (B + c )`s 1 day work = 1/10 ( C+A)`s 1 day work = 1/12 2 ( A + B +C )`s 1 day work = 1/20 + 1/10 + 1/12 = 3 + 6 +5 / 60 = 14 / 60 = 7/30 Therfore , (A+B+C)`s 1 day work = 7/30 x 1/2 = 7/60 Hence A , B And C can finish the work together in 60/7 days or 8 4/7 days.